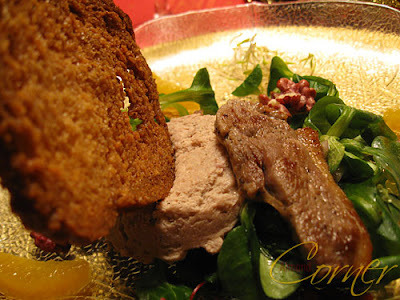 I was curious about the mousse that turned out very aromatic and made a great match with the salad. 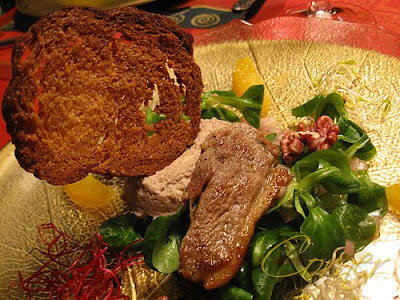 I also served a slice of canard that I marinated in chardonnay with some rosemary for about an hour. To the salad I have added some red walnuts that taste pretty different than the normal walnuts, these are sweeter and somewhat less nutty. 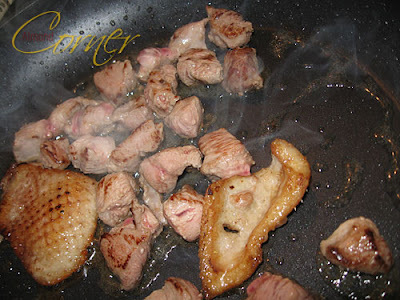 Remove the skin and fat of the canard breast and cut it in cubes. Heat a saucepan and add the skin and fry it until the fat comes out. Add breast cubes and fry for 3-4 minutes. Season with salt, pepper, majoram, thyme and cinnamon. Set it aside and pour chicken stock and portwein into the saucepan and reduce to half. Stir in gelatine and set aside to cool until it is lukewarm. 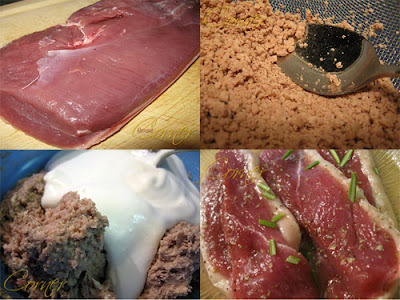 Ground fried canard breast and after smear it through a sieve. Stir in butter and the liquid with the gelatine. Beat heavy cream and fold it into the mixture. Season with salt, pepper and some portwein. Fill mousse in portions and let is stand for 2-3 hours in the fridge. For the salad chop shallot, salt, pepper add vinegar and let it stand for 30 minutes. Whisk in oil and pour it over the salad.